The world of Roshar is under threat. A mysterious assassin is slaughtering the rulers of the nations. In the east, the armies of Alethkar and the Parshendi are clashing on the Shattered Plains. Signs are appearing that the evil voidbringers are returning to bring about the Desolation, the destruction of the civilised world. But there are also signs that the Knights Radiant, humans empowered with amazing abilities, are returning to stop them. 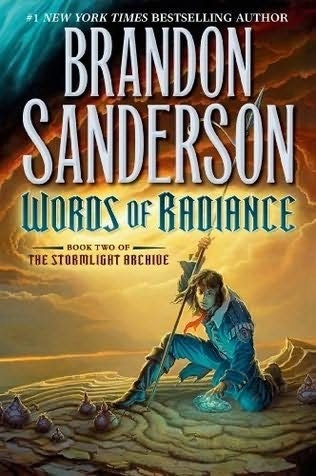 Words of Radiance is the much-delayed second volume in The Stormlight Archive series (expected to last for ten volumes) and the sequel to 2010's The Way of Kings. Brandon Sanderson's work on this novel was delayed by his commitment to completing Robert Jordan's Wheel of Time sequence. With that accomplished, Sanderson is now free to focus on his own mega-epic and bring out future novels in a more timely fashion; the third Stormlight novel (working title: Unhallowed Stones) will likely follow before the end of 2015. Like much of Sanderson's work, the novel balances traditional epic fantasy tropes with highly original and interesting worldbuilding, logically well-thought-out magic systems and hints of a much grander plan lying behind everything. Whilst only the second book of The Stormlight Archive, this is also the eighth novel set in his Cosmere universe (following on from Elantris, Warbreaker, the four Mistborn novels and of course The Way of Kings). Whilst previously the Cosmere links were fairly subtle and mostly of interest for Easter Egg hunters, in this series they are much more overt. Hoid (aka Wit), who only appeared in minor cameos in the other books, plays a much more important role here. Words of Radiance is also big. At over 400,000 words, it's the longest epic fantasy novel published since George R.R. Martin's A Dance with Dragons, approaching 1,100 pages in hardcover (so yes, the UK paperback will be split for publication next year). It's an immense novel, not because an enormous amount happens but because Sanderson lets events unfold at a fairly relaxed pace. We only have four major POV characters (Shallan, Kaladin, Dalinar and Adolin) and a whole host of minor ones in remote parts of the world that we flit between. The minor POV chapters are highlights, with Sanderson crafting each one almost into a separate short story set in the midst of a grander tale. The story about the trader who has to make a bargain with a bunch of people who live on the back of a vast creature dwelling in the sea is effective, as is the story of a young burglar who turns out to be more than she appears. Whilst these stories are enjoyable, they also feel a little random sprinkled throughout the longer book, especially since their consequences may not be explored in full until the second half of the series. The main narrative, unfortunately, is much slower. After we spent most of the first, 1,000-page volume on the Shattered Plains we then proceed to spend most of the second, even longer, volume in the same place. 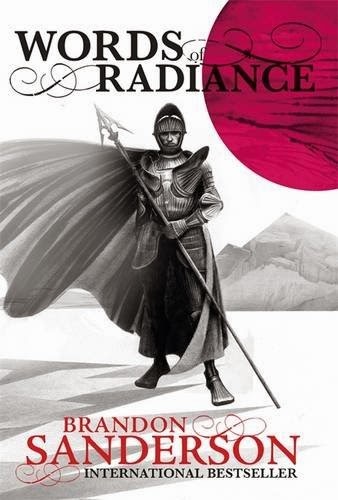 The first book had the advantage of introducing the location and its weird alien landscape, but by at least a quarter of the way through Words of Radiance the setting has lost a lot of is lustre. Fortunately, the end of the novel suggests that we have left behind the Plains and won't see them again, which is well past time. The interludes show that Roshar is a fascinating, well-designed and evocative location and getting to see more of it in future volumes rather than just one broken landscape will be a relief. Whilst the story is slow to unfold, it does at least move things forward significantly. More Knights Radiant appear, we learn more about the world, its history and its cultures and there are some surprising and shocking deaths (although at least one of them turns out to be a disappointing fake-out). Readers of the other Cosmere books will also have a head start in working out what's going on, which is good for them but possibly a little unfair for more casual readers. Up until now - even arguably including The Way of Kings - the Cosmere stuff has been optional background only, with it not being necessary to read every book in the setting to enjoy the next one. Words of Radiance is the first time I felt like being familiar with the Cosmere was necessary to fully appreciate what the author was doing. This is made clear in no uncertain terms when the novel ends with an event which will won't make much sense unless you've also read Warbreaker. On the character side of things, Sanderson is definitely improving novel to novel. Shallan, the least-developed character in the previous novel, takes centre stage here and becomes a much more rounded and interesting figure. Her forced humour and defensiveness, which was previously just annoying, is fleshed out a lot here as we get to know the reasons for it. Given it's not something he's known for, Sanderson successfully turns Shallan's story into an effective and unexpected tragedy. Adolin also graduates from 'heroic buffoon' to a slightly darker, more complex character (though not until quite late in the novel). Kaladin's unrelenting emoness continues unabated (despite his transformation into a fantasy version of Neo from The Matrix), but he's a much less dominant character this time around and he does lighten up as the book goes on, which is a relief. More problematic is the dialogue, which often feels clunky and sometimes incongruous. Roshar isn't Earth or even particularly reminiscent of any of our own time periods, but the use of modern language and terms ('awesomeness', 'upgrade') may be distracting for some readers. Sanderson's signature magic systems are present and correct, though it's possible he's gone overboard in the Stormlight books. There are something like thirty magic systems on Roshar (even if they are variants on similar themes) and the relationships between Surgebinding, Lashing, Truthspeaking, the Old Magic and so forth are not very clearly defined. It also doesn't help that some of the magic systems of the other Cosmere worlds are also alluded to (one character is even a Misting from Scadrial, the setting of the Mistborn novels, though he barely appears). Whilst previously Sanderson has outline his magic systems with clarity, here it feels like he's been taking some lessons from Steven Erikson and just decided to drop the reader into a confusing maze which they have to work their own way out of. Words of Radiance (****) is a good book beset by minor problems: dialogue issues, a languid pace and often irrelevant-feeling (though often individually fun) side-chapters. At the same time it features much-improved characters, superior worldbuilding and some impressive action set-pieces. I don't think Stormlight is ever going to be as era-defining an epic fantasy as The Wheel of Time, A Song of Ice and Fire and The Malazan Book of the Fallen are, with Sanderson sometimes definitely 'trying too hard' to match those stories for scale and scope and missing their strengths with character and plot, but it's still a readable and fun series. One thing I think Sanderson definitely needs to do with future volumes is make them smaller, trim the fat and give a more focused story each time. The novel is available now in the UK and USA. I agree that Jordan and Martin are a bit more visionary kind of world builder, even if Roshar's seabed-turned-desert theme with killer shrimps is very fascinating. I think Jordan made a smart move when he appointed Sanderson to finish his Wheel of Time: Sanderson is a better world planner, IMO. A better planner in general. I still found the Dark One and the final battle to be quite a letdown, he also didn't get quite some characters. But he definitely never fell into bad writing habits like Jordan did. Or have trouble with a Meereense Knot like problem as Martin. I really like the Stormlight Archive, my current gripe is that "the superpowers" of the Radiants are in danger to become a bit too common and the last character Wit is talking to in the book also shouldn't have been there, that felt wrong to me. I am happy that you and a few other reviewers mentioned the improved character development. That was my biggest complaint about TWoK. After the first book, I was worried Sanderson wouldn't be able to create enough nuance to make each Knight Radiant unique and interesting. I agree that I do not see The Stormlight Archive becoming a genre defining epic. If anything I am wondering if we have seen all of Sanderson's tricks as he seems to increasingly include the same ideas in each series. The Hero is dead, God is dead, what is next...the universe? Those criticisms aside, I have already bought WoR and will most likely enjoy it. But, my expectations are not as high as they were with TWoK. As anachronistic as the use of the word "awesomeness" is in a fantasy series, I actually loved Lift's use of the word. It made me giggle and grin throughout her Interlude chapter. For me, it truly showed how excited her young mind was at her ability, at how cool (or "incredible" if you want to be a bit more archaic, since it is fantasy) she found her power to be. I have thought many times in the past about what sorts of phrases "belong" in fantasy settings, whether or not more modern real world usages of words were appropriate for pre-technological societies, and usually I would agree with you Adam, they don't belong; they give an "off" feeling, as if something we're out of place. In this example however, I can forgive it, because to me it felt right. Perhaps it is a sign that with the changing nature of our language, fantasy literature should do a little catching up on the way language works. I mean, we KNOW these characters (like characters in most fantasy) are not actually speaking ENGLISH, yet reviewers and readers rarely complain about other fantasy novels having puns that are based in English, or even more commonly, poems dependent on the rhyming of English words. That sort of thing, where the dialogue references the way a word is pronounced or spelled, throws me off more than the usage of "awesomeness." And to be fair, what Lift can do is really pretty damned AWESOME, especially in the mind of a early teenage (13-14 year old) street kid. Finished it myself on Thursday last and have been pondering over things since. Whilst the majority of it is set on the Shattered Plains, it definitely doesn't drag as much as Perrin chasing after Faile or Brienne & Jaime's trek across war torn Westeros. There are a lot more political machinations occurring than you typically get in fantasy and whilst Sanderson isn't ever going to be put into the grimdark pigeonhole, generally it's handled pretty well. A lot of progress happens but some of it, like Kaladin getting more and more accepted by Dalinar and Adolin has to take time to seem more realistic. It was a nice touch when Adolin incarcerated himself for example. Given the wait I've had for GRRM, JV Jones and Stephen Donaldson, I must admit to not realising how long it had been since the first one either.